Independent artists, who aren’t afforded the same protection as big brands on Amazon, say that fighting copyright infringement by third-party sellers is never-ending. They want that to change. When artist Susie Ghahremani first came across a seller impersonating her on Amazon, she stayed up until 6 a.m., clicking through hundreds of the seller’s listings and reporting over two dozen URLs featuring counterfeit products. 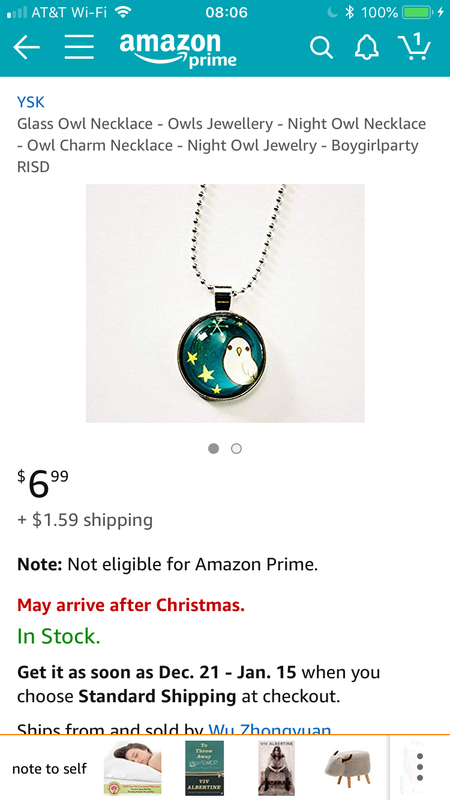 The rip-offs of her designs on Amazon were blatant: One listing used Ghahremani’s photo of a necklace she’d made, which featured her owl illustration in its pendant. The seller also claimed “Artwork by me, Susie Ghahremani” in the description. Still, Amazon denied Ghahremani’s takedown requests four times and only relented after her tweet chastising the company went viral. The issue of stolen artwork on Amazon is widespread and well-known, but the company hasn’t addressed the infringement in a meaningful way. Fighting unauthorized use of artists’ original work on the site remains a constant battle. Though Amazon has a Brand Registry that allows Apple and other businesses to upload their trademarks and combat counterfeiting, independent creators who spoke to BuzzFeed News say the program doesn’t work for them — but they believe it should. Works of art are considered copyrighted goods and are not trademarks, like a brand name or logo, so artists don’t qualify for the “proactive brand protection” Amazon’s Brand Registry provides. Artists, photographers, and designers must instead resort to removal requests. They claim Amazon is slow to heed takedown notices and sometimes rejects them, even when listings clearly feature stolen photographs and artwork. They say that it often forces them to file complaints over and over again and that the site does not ban flagrant repeat offenders from its marketplace. And even when the company does remove infringing listings, the same stolen artwork often crops up again elsewhere on the site. On top of that, while the law requires Amazon to remove infringement, it does not hold the company responsible when artists sue the e-commerce giant for hosting stolen artwork and providing logistics for sellers who offer it. “It would be ridiculous for us to try to combat this. We’re a small business,” Bryan Ambacher, the owner of Etsy shop CosmicFirefly, whose handmade jewelry is often copied and sold on Amazon, told BuzzFeed News. “We don’t retain an attorney. We make $150,000 a year in sales. And Amazon’s gotten so big that it’s like whack-a-mole. It makes me think you can’t beat Goliath,” he said. Independent artists say they spend hours filing takedown requests each month and lose thousands of dollars in the process each year. Amazon, whose marketplace hosts over a million third-party sellers, is the biggest store on the internet, and its massive scale makes it virtually impossible to police every listing with complete accuracy. The company does prohibit review manipulation, products promoting racist and hateful ideologies, scams, and copycat items — but these problems persist on the platform and harm both creators running small businesses and customers who are tricked into buying shoddy products. Still, artists say that Amazon has failed to implement even minor changes that might more effectively combat the problem: things like making it easier for customers to flag infringing listings, or implementing image recognition technology, which Amazon already has, that could identify and flag previously removed artwork. Amazon is required by US laws, including the Digital Millennium Copyright Act, to heed takedown requests from art copyright holders. “Amazon absolutely has to comply if they receive notice, under the DMCA,” said Joel Rothman, an intellectual property lawyer specializing in infringement cases. But according to independent artists, Amazon typically doesn’t fulfill their first requests, and it sometimes offers inconsistent explanations as to why it doesn’t have to. 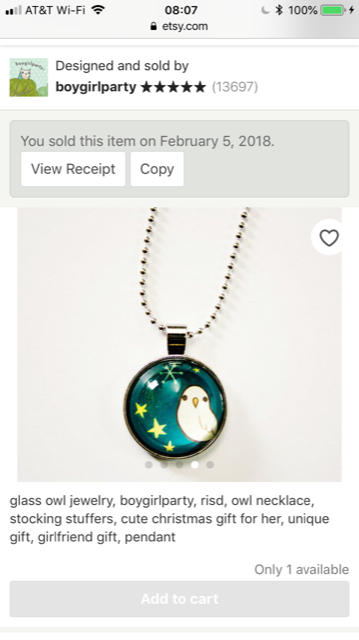 Ghahremani was dumbfounded in December 2018 when Amazon repeatedly refused to remove the listing of an owl necklace she reported. The artwork and product photo was hers, but the listing wasn’t. “It shouldn’t have been a big deal. You’re not suing, you’re not making unreasonable demands — just that it gets removed — and Amazon won’t even respect that,” said Ghahremani. She used the site’s infringement claims Public Notice portal to report the listing, and included links to her website and Etsy shop, called Boygirlparty. Over email, Amazon initially told Ghahremani it couldn’t verify that she held the copyright to the work (even though her name was on the unauthorized listing). After another attempt, Amazon said it couldn’t verify her identity. Then the company wrote, “The copyright you provided does not match the content you reported. Please provide a URL.” The emails from Amazon appeared to be automated. She responded with two screenshots, of her Etsy shop and the Amazon listing, pictured side by side. In its fifth and final response, Amazon denied the request because — again — the listing “didn’t match” Ghahremani’s copyrighted work. Frustrated, Ghahremani tweeted about the incident. Several hours (and hundreds of retweets) later, the dozens of listings she’d reported suddenly disappeared without any acknowledgment from Amazon. Making and selling art is Ghahremani’s only source of income. But filing DMCA takedown requests “has become a fairly daily issue for me to deal with,” Ghahremani said. “We remove infringing items as we become aware of them, permanently remove bad actors from selling in our store, and use notices of infringement to strengthen our proactive systems,” an Amazon spokesperson said in a statement. Identifying products stolen from creators on Amazon’s marketplace doesn’t require a high level of technical skill. Using Google’s reverse image search and looking up names watermarked on images, BuzzFeed News reviewed listings from the Amazon seller, called Wu Zhongyuan, that Ghahremani had reported, and found 32 items ripped directly from nine different Etsy stores. Reviews on Wu Zhongyuan’s products indicate that Amazon customers didn’t receive the products shown in photos. “This product is TERRIBLE and absolutely not worth a penny. The keychain is standard but you cannot read a word that is written on it, it is sloppily made and poor quality is an understatement,” wrote one customer. “Do not waste your money!” said another. The seller did not respond to BuzzFeed News’ multiple requests for comment through Amazon’s seller messaging system. CosmicFirefly is one of the Etsy shops Zhongyuan lifted photos from. 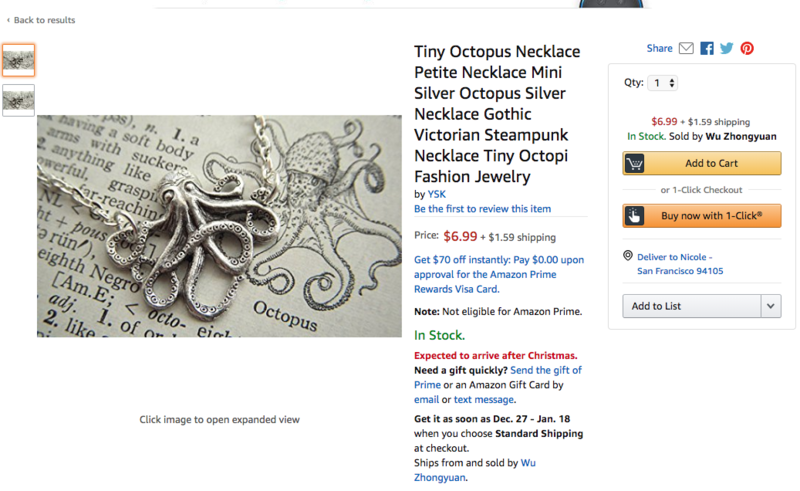 CosmicFirefly sells its octopus necklace for $21.24, while the copycat Amazon listing offers it for $8.58. “We put pride in the fact that I’m an artist handcrafting these pieces. It’s horrible seeing someone undercutting the price of something I sell,” said Bryan Ambacher, who runs the shop with his husband Nathan. “It makes me mad. I’ve consistently made less money every year for the last five years selling on Etsy, and this is one of the reasons why. It’s like someone breaking into my house, taking all of my stuff, and selling that,” he added. Many factors contribute to Amazon’s problem with products that infringe on copyrights. However, artists point to sellers who continually list stolen photos and work — even after having listings removed for copyright violation — as one of the issue’s primary drivers. In July 2018, illustrator Jessica Roux found and reported over 20 products featuring her stolen work from an Amazon storefront called Weeya, which is still selling on the site. “That seller didn’t get banned. I think 22 should do it,” Roux said. Weeya did not respond to BuzzFeed News’ multiple requests for comment through Amazon’s seller messaging system. Amazon did not respond to questions about whether it enforces a strike-based system for sellers who repeatedly violate copyright. On Etsy, members who receive repeat notices have their account privileges terminated. Like Ghahremani, Roux is exasperated by how difficult it is to get Amazon to take down infringing listings. When she submitted her first DMCA notice in 2016, the company denied the request, saying Roux had wrongly submitted a trademark complaint, instead of a copyright one, which she denies. Two weeks after Roux resubmitted the complaint, Amazon removed the listings. Later she said the same seller republished the listing, a smartphone wallet case featuring her illustration of white magnolias. The same case, with Roux’s stolen artwork, continues to circulate in the marketplace: It is currently being sold through 21 different Amazon listings today. “The impetus is on me is to file reports for zero dollars. These are hours that could be spent shipping orders or making more work,” she said. Considering her freelance hourly rate (which, on average, is just under $100), Roux estimated that she’s lost “a couple thousand” dollars this year alone on finding fraudulent listings and going back and forth about them with Amazon. Roux recently hired an intern to help her with the reports. “There’s not a system in place to ban repeat offenders. There’s no system to check to see where my work is. It’s like trying to find a needle in a haystack.” Roux said. Natasha Hulme and her partner, photographer Michael Penn, have grappled with the same issues. In November 2018, they started a Change.org petition calling for a tool that would help identify copyright infringement on Amazon. More than 5,000 people have signed it. Hulme pointed to YouTube’s “Content ID,” a system that scans videos uploaded to the platform against a database of audio and video files submitted by copyright holders, as a model for a possible solution. Using image recognition to compare illustrations or photographs would be relatively straightforward, said Ruzena Bajcsy, professor of electrical engineering at University of California, Berkeley: “This technology is not rocket science.” Techniques for applying matching algorithms to images are well-known, Bajcsy said. Such a system, if Amazon rolled one out, might not be completely accurate in identifying all infringement, but it could at least catch the most egregious violations. Amazon does, in fact, have image recognition technology that it seemingly could use to curb the proliferation of counterfeit art on its platform, but doesn’t seem to have applied the software in the same way that YouTube’s Content ID addresses copycat videos. The Amazon mobile app’s “search by camera” feature allows a customer to search for products with their phone’s camera. BuzzFeed News used the in-app feature to quickly find dozens of listings with stolen copyrighted images. After showing the feature to Roux, she used it to identify — and successfully request takedowns — for 658 listings on Amazon that ripped off her artwork. The same tool surfaced 24 unauthorized listings of illustrator Camille Chew’s “Witchcraft” art. Amazon's in-app "search by camera feature" surfaced dozens of listings featuring Jessica Roux's and Camille Chew's stolen artwork. In a statement, a company spokesperson said, the site’s systems “automatically and continuously scan numerous data points related to sellers, products, brands, and offers to detect activity that indicates products offered might be infringing and proactively prevents them from reaching our store,” but did not specify whether image recognition software is used to combat stolen artwork. Many artists who spoke to BuzzFeed News acknowledged that getting art stolen is a reality for those who publish their work on the internet. “As an artist, I can’t stop sharing my work online, because that’s the best way to reach an audience,” Chew told BuzzFeed News. “I feel like it’s inevitable that it’ll get stolen, but I wish there was more regulation put in place,” she added. Images often have a life of their own on social media sites like Pinterest, Instagram, and Twitter. Eventually, the source of the art get lost or becomes irrelevant, and the work continues to be posted — without credit. The law doesn't hold Amazon directly responsible when third-party sellers steal and sell knock-off art on its marketplace — even though it's illegal. In 2013, Milo & Gabby, a company that makes animal-shaped pillows, sued Amazon over fake versions of its products being sold via “Fulfillment by Amazon,” a program through which the site handles the storage, packing, and shipping of third-party sellers’ inventory. In 2017, a federal appeals court decided that Amazon, as a “provider of online services” is not itself the seller, and that the third-party seller “is responsible for the uploaded content.” Outcomes like these give the e-commerce giant less of an incentive to address creators’ complaints. “The scale of the problem has grown so tremendously. On the one hand, theoretically [DMCA] is supposed to be helpful. On the other hand, it’s almost impossible for everyone to keep up,” said Rothman, the intellectual property lawyer. Rothman has filed hundreds of infringement cases against Amazon. “The people I talk to at Amazon do care about it. They want to comply. But it’s very difficult; it’s the biggest store in the world and hard to police. I think they’re doing what they can, but could they do more? Yes. Could they do better? Yes,” he added. One of the main issues with sellers, he says, is that many assume, because the art is on the internet, it’s free to use. For now, creators are largely on their own when it comes to protecting their work. But a case currently being considered by the Supreme Court may have major implications for artists. Depending on the outcome of Fourth Estate Public Benefit Corp. v. Wall-Street.com, it may streamline and speed up the process to sue for infringement. “The copyright office takes, in some places, years. This [case outcome] would be tremendously helpful,” Rothman said. Amazon isn’t the only online marketplace hosting stolen artwork. 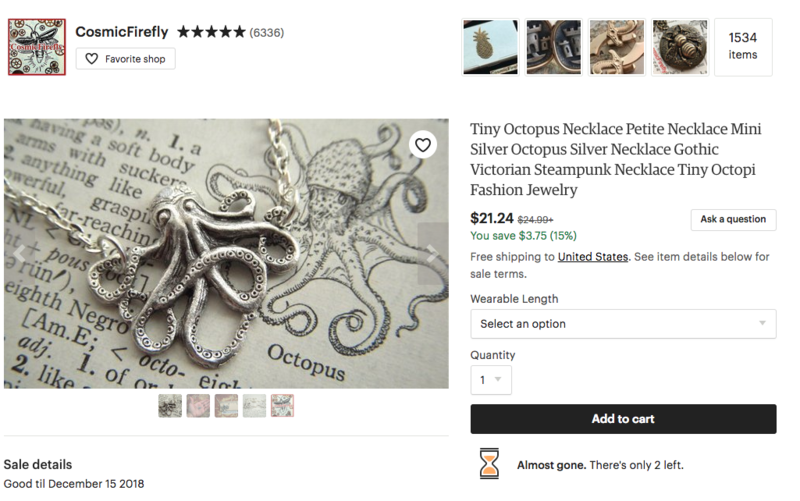 Both Etsy and eBay have dealt with their fair share of third-party sellers hawking counterfeits and copyright-infringing goods. (In a statement, an Etsy spokesperson said, “As a venue for artists, designers, and makers, Etsy takes intellectual property rights very seriously. ... When we are notified about infringing material, we remove the content and contact the allegedly infringing party to provide information about the notice and removal.”) But Amazon’s global scale, with product sales totaling $118.57 billion worldwide in 2017, means that when independent artists file takedown requests, they’re spending a lot of time doing it on Amazon’s website. Meanwhile, creators must rely on Amazon, which makes a commission from every purchase, to remove listings it can profit from.